The S.S. Connaught — a luxurious ocean liner considered the Titanic of its era — has finally been discovered. The 380-foot iron-hulled side-wheeled steamer sunk in 1860 after it caught fire en route to Boston. The ship hadn't been seen in 154 years. 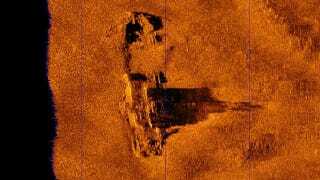 The Endurance Exploration Group started their search in earnest last year with a summer sonar scan covering over 700 square miles. That's roughly equivalent to searching an area of ocean bottom 30 times the size of Manhattan. Earlier this month, the team returned with a remotely operated underwater robotics vehicle (ROV) to inspect an encouraging signal. The investigators were able to identify the wreck by its distinctive hull, paddlewheels, and artifacts within the debris field. EEG team member Taylor Zajonc spoke to io9 about the discovery. "We knew we'd found it when we spotted the first paddlewheel on video. After being storm-battered, burnt, sunk, hit with trawling nets and 154 years of exposure to the deep ocean, those wheels still stand tall and proud. I got chills." The project will now enter into the recovery phase,which means documenting and retrieving historically significant artifacts and cargo from the wreck. The Endurance Exploration Group is not engaged in marine archaeology; rather, their mission is "to seek out and recover long-lost riches from ships vanished in the ocean's depths." In addition to pulling up lost riches — the ship is thought to have carried upwards of £10,000 in gold coins, possibly bound for a visiting member of the British royal family — EEG also wants to make a documentary film or television special to "fully tell the remarkable story of the loss of the S.S. Connaught." "We'll return to the site as soon as possible," said Zajonc. "Any shipwreck in the area gets hit by trawler strikes and this is no exception. In a word, the site is being slowly destroyed. We'll use robotics systems to rescue the gold cargo and document any historically important artifacts. In the meantime, we want to share this story of fire, shipwreck and near-miraculous rescue with anyone who loves the subject as much as we do." This ship's final journey was a remarkable one, indeed. At the time, it was one of the largest and most luxurious ocean-going liners in service. The ship departed Galway, Ireland on September 25, 1860 bound for Boston by way of St. John's. Onboard were 50 first-class passengers, 417 in steerage, and a full crew of 125. But during the final leg of her journey, the ship sprung a leak when a storm hit. It was brought under control, but by that point a fire had started below deck. Smoke and flames forced passengers and crew to the top deck. Lifeboats were lowered, but they were smashed by the violent waves. All seemed lost, but a small merchant ship sailed to intercept the burning ship. According to eyewitness accounts, the hulls of the Connaught were so hot they boiled the waves as they crashed against her. A line was thrown across decks, transferring women and children first, then the male passengers and crew. Eventually, so many people boarded the tiny fruit transport that they stood on every available patch of deck — some even clinging to the tall masts and rigging. Once everyone was off the Connaught, the captain joined them. Safely aboard the merchant vessel, they watched as the ship disappeared beneath the waves. Incredibly, nearly 600 people had been transferred from one of the largest ocean liners of the time to a tiny ship without incurring a single loss of life. The rescue ship arrived at Boston's India Wharf the following day. "The Connaught has tremendous significance to the region," Zajonc told io9. "She was one of the largest steam liners of her time, a true Titanic of her era. She was lost on only her second voyage. But unlike the Titanic, every soul aboard her was saved under the most improbable of circumstances. This incredible rescue was due entirely to the courage of her crew and the crew of a tiny fruit ship and is a story that must be told." All images: Endurance Exploration Group, Inc.